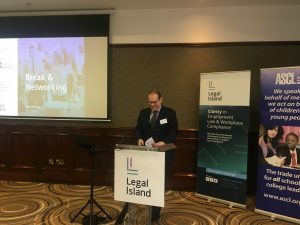 O’Reilly Stewart Solicitors’ Director Seamus McGranaghan has presented at the Legal Island Education Law Update 2019, held at the Dunsilly Hotel in Antrim on March 21st. Attended by School Principals, Vice Principals, and other school leaders including teacher union representatives, the annual seminar is designed to provide a learning experience on pertinent issues currently facing the education sector. Delegates listened to expert opinion on, and participated in exercises around four main areas – Grievances and actions to frustrate the process; Stress, Grievances and Alternatives; Alcohol problems; and Parental complaints. O’Reilly Stewart Solicitors presented specifically on alcohol and drug-related issues affecting teachers in schools. Commenting on his involvement, Seamus said; “It is generally agreed that the teaching profession is becoming a more difficult job year on year, and figures* show more teachers than ever are turning to alcohol and prescription drugs to cope with the pressures. “Dealing with someone presenting with a drug or alcohol problem in school can be complex and delicate. Specific TNC guidance is available but that’s only half the story.